If you need a first class electrical service in the London and Home Counties area; particularly Whyteleafe, Cheam and Banstead then South London Electricians is the place to come. With over 23 years’ experience in both residential and commercial services and a team of dedicated experts we are there for you, whatever you need, whenever you need it. Open 24 hours a day, 7 days a week our team of professional, skilled and reliable electricians are on hand to give you the very best solution to your needs. With our expert knowledge and City and Guilds qualification you know that we have the right tools to resolve your issue, in the minimum time and at minimum cost to you. Residential tasks such as; fuse board replacements, rewiring your property, electrical testing and even power shower installations. Business needs just like; security lighting, CCTV installation, data cabling and sound and multimedia system setup. Of course our service isn’t just limited to these areas and our expert guidance and advice expands into a much wider set of needs. A popular area that we find ourselves working with business in is energy saving lighting, offering guidance to business owners on the best ways to reduce their own carbon footprint. Another invaluable service that we provide is an emergency callout. Particularly useful for those residential clients who are in urgent need of help with an urgent electrical problem. In times of need, whatever the time of day just call us at Southern London Electricians and you can discuss your issue with a member of our team. In the majority of circumstances we will be able to offer you a short term resolution there and then on the phone. This will help you in that short period of time while we are on our way. Every project that we undertake; whether emergency or not you can be sure that we will always work hard to ensure a swift resolution. As well as this we aim to have minimal impact on your life and property. Before we undertake any work we will also offer you a non-obligation quotation, so that you can see just how dedicated we are to providing a cost effective yet high quality service. Our expertise and experience in the field makes us the right electrician for you. No matter what the size of your task, from light switch fittings to industrial warehouse installations you can be sure that we are there for you. 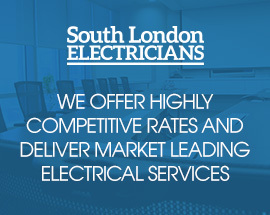 Call us today on 07956 523316 and discover the South London Electricians dedication to service.